Because of its dual release, the book will have a significant first printing although Adams said the exact size of the printing has not been determined as yet. Logicomix is a full-color 336 page book ($22.95) that also features a glossary of technical terms and prose annotations on all of the historical figures in the book. There’s a 10-city book tour that will focus on Universities in Boston, Philadelphia, Chicago, Seattle and other towns and there’s a website, logicomix.com, that features media and background information on the writers; the remarkable artist team of Papadatos and Di Donna as well as behind-the-scenes video on the making of the book. Adams said Bloomsbury plans to make its first forays into the sometimes arcane world of comics conventions to promote the book and foreign rights have been sold to 9 countries among them France, China, Israel, Holland and Turkey. While the life of Bertrand Russell is the core narrative of Logicomix, the book’s focus is really on Russell’s life work—a passionate and ultimately futile attempt to establish a foundation for modern mathematics on clear and concretely stated logic. Beginning in the early part of the 20th century Russell and other prominent mathematicians sought to establish a set of rigorously conceived logical proofs that would eliminate the paradox and circular logic typical of mathematics of the era. Logicomix is the story of that passionate search for philosophical truth and along the way documents both the efforts of Russell (in particular the writing of his seminal book Principia Mathematica coauthored with Alfred North Whitehead) and a long list of prominent turn-of-the century intellectuals who struggled with these questions in the pursuit of an unattainable intellectual dead certainty. 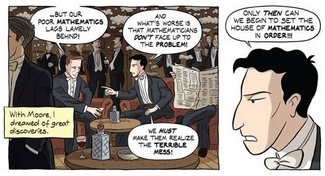 In fact, Logicomix can be seen as a book about Russell’s failure to achieve his goals, even though his work laid the groundwork for mathematics and logic as we know them today. While the book is the story of extremely smart men wrestling intellectually with profound abstractions, Doxiadis, Papadimitriou and the artists have managed to produce an exuberant historical yarn filled with antic portrayals of an impressive list historical figures, men who either influenced Russell’s thinking, or argued passionately with him over their own conclusions and differences. Indeed Logicomix ruminates on such figures as the ancient Greek playwright Aeschylus and offers lively portrayals of the likes of such early 20th century intellectual figures as David Hilbert, Kurt Godel, Alfred North Whitehead and Ludwig Wittgenstein. 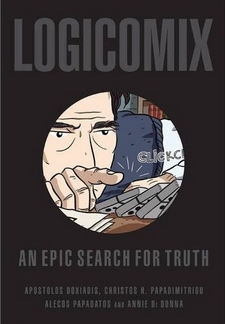 But besides all that, Logicomix is an accessible general primer on basic mathematics, reason and logic that will engage ordinary readers while it skillfully shows the connections between Russell’s own search for intellectual certainty and the great moral questions of our time. Not a bad day’s work for a comic book. Although written in collaboration with Papadimitriou, a professor of computer science, Doxiadis is the primary creator and driver of this project. Adams describes him as something of a prodigy—at the age of 15 he studied mathematics at Columbia University in New York—and much later he wrote a bestselling prose novel, Uncle Petros and Goldback’s Conjecture, also published by Bloomsbury. Adams said Doxiadis put up the money to produce Logicomix himself—a considerable investment for a 300-page full-color work—and the book was produced in Greek and English at the same time for international publication. Indeed both the writers and the artists are also characters in Logicomix and the reader gets to watch them working through the project, reworking the book’s themes and arguing over the book’s fitful progress even as we read through the now-completed work. Click here to read the article at the PW Comics Week website.